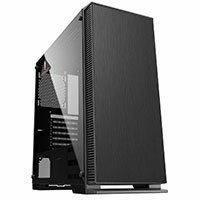 Brand new for 2018 Game Max are proud to introduce the Game Max Knight Midi-Tower Gaming Case, with a full tempered glass left side panel and the front panel comes with unique heat transfer printing technology. 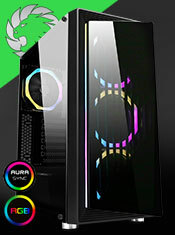 The Knight can fit up to six fans, 3 at the front, 2 at the top and 1 at the back making it the ideal solution for the gaming enthusiast and an excellent cooling solution to help keep the computer temperature low. 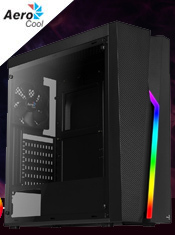 The Knight has a modern look to it and the capacity to fit up to 6 fans and up to a 240mm radiator at the front and a 120mm radiator at the back means this case can accommodate any gamers needs no matter how big the challenge. With the Knight a PWM hub is included you can control your fans by Choosing RGB SYNC or manual mode, that works in tandem with your built-in PWM hub located behind the M/B panel, Which provide normal 3pin fans to share the PWM auto speed function. There is HD Audio, 2 x USB 3.0 and 1 x USB 2.0 situated on the top panel to give the user easy access so they can connect to a wide range of media storage devices. There is room for 5 HDDs, 3 x 2.5" HDD / SSD and 2 x 3.5" HDDs. Design - The Knight is a premium designed Mid - Tower gaming case with 4mm tempered glass left side panel to showcase your build. The front panel comes with unique heat transfer printing technology. High Efficiency Cooling System - You can fit up to 6 fans in the Knight, which complements well with the greater space to give you optimised airflow. Removable Dust Filters - Two dust filters included with the Knight protects your chassis from dirt and dust and helps it perform to its maximum.